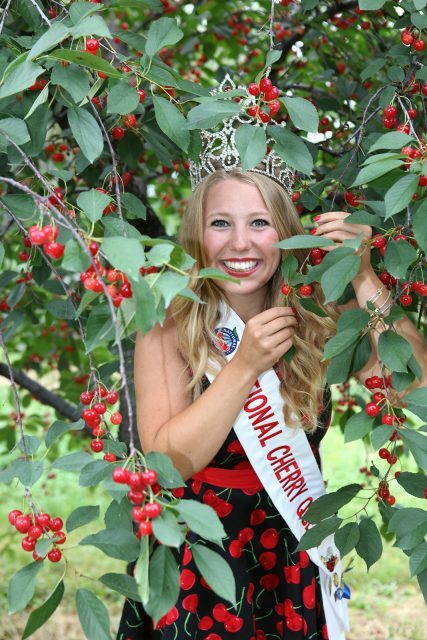 National Cherry Fest Queen Abbey Kaufman. We’re in the throes of the National Cherry Festival in Traverse City, Mich., and that has us thinking about how grateful we are for all Michigan cherry growers. Without those delectable sweet orbs of deliciousness that are being harvested right now, our two Mackinac Island cherry fudge flavors wouldn’t be as good as they are. Our Original Murdick’s Fudge Chocolate Cherry fudge exudes a deep and sultry tart taste. 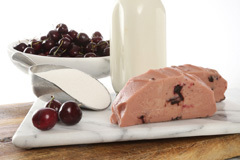 Michigan cherries are the very first thing you notice when you bite into this succulent combination in which chocolate plays a supporting role by offering up just a hint of sweetness underneath the high notes of our favorite summer fruit. Murdick’s Chocolate Cherry fudge — delish! 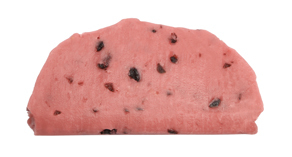 Then there’s our Traverse City Black Cherry, which is light pink with dark chunks of cherries. The cherry bits add a subtle layer of texture and chew, as well as a zip of bright tartness against that natural Michigan-sugar base. Murdick’s Traverse City Black Cherry. But back to the festival! Just a short time ago, we hosted this year’s National Cherry Festival queen, 21-year-old Abbey Kaufman (born and raised in Traverse City), in our Main Street store as guest fudgemaker. Abbey, of course, was happy to give the big wooden spoon a twirl … and a swirl! Between the special appearances and her Mackinac Island explorations, we caught up with Abbey, a busy Central Michigan University student, and asked her a few questions about everything from her Mackinac memories to her fudge-making experience. Original Murdick’s Fudge: We are partial to our cherry fudge flavors because for years, we’ve been heading to the orchards in Northwest Michigan, hand-selecting perfect Pure Michigan cherries for our special concoctions. We’re proud that Michigan ranks first in the nation in the production of Montmorency tart cherries and ranks fourth in the nation in the production of sweet cherries. Yes! You tried our cherry fudge flavors on your recent visit to our store … what did you think? Our Traverse City Black Cherry fudge is chockfull of northern Michigan’s finest fruit! OMF: Now that you’ve spent some time as a guest fudgemaker, what are your thoughts? AK: I have a great deal of respect for the people who make fudge now, after having the opportunity to help make it! My favorite part was seeing and paying attention to the unique ways each maker creates the fudge. I think I overlooked that before, but when you’re handed a giant wooden spoon and asked to stir a ginormous boiling-hot pot of fudge ingredients, you realize how awkward and hard that can be. OMF: In your opinion, what’s the hardest part of making fudge? AK: For sure, it’s just after the fudge is poured on the table and the metal molding is removed from the outside. It’s starts spreading fast and you really have to keep up and work quickly so it doesn’t slide off the marble table, all while being neat with the paddle and not sloppy. OMF: Indeed, shaping those fudge loafs and then cutting them into beautiful slices is an art unto itself. What are your other fudge-making takeaways? AK: The people (like Carnel) who work at Original Murdick’s Fudge make the process look effortless. When they flip the fudge around the table, you can tell it’s ingrained muscle memory. OMF: How was your Mackinac Island experience overall? AK: I visited Mackinac Island as a kid a few times, but I think I enjoy it now even more so as an adult. I could bike around the island and eat fudge for days! I now have a better appreciation for the beauty and history of the island. OMF: Do you think you’ll make Mackinac Island and Original Murdick’s Fudge a regular stop on your vacation agenda in the future? AK: Oh yes. While some people say they’re going Up North for the weekend, being from Traverse City, if I say I’m going north, I have to find places more northern for little getaways, and Mackinac is definitely my top pick! Want to enjoy Pure Michigan cherries? Try them in our Chocolate Cherry or Traverse City Black Cherry fudge flavors. We hope to see you in one of our Pure Michigan fudge shops soon, but if you can’t make it, order online here! Absolutely, hands down (and hands on!) the best fudge on or off the Island!!! We just returned home to Fort Wayne, IN after visiting Mackinac Island. We made sure to bring home some Original Murdick’s Fudge to share with friends and family. Delicious! THE ART OF FUDGE MAKING AT ORIGINAL MURDICK’S ON MACKINAC ISLAND REQUIRES A PERFECT PURE MICHIGAN RECIPE AND SKILLED TECHNIQUES WHEN SHAPING OUR DELECTABLE FUDGE INTO LOAVES. We handcraft Original Murdick's Fudge at four locations on Martha's Vineyard.